Winning sales leaders have a constant eye on their sales team’s performance by measuring their achievement of Sales KPI targets. Measuring team and product performance through KPIs is the best way to assess the effectiveness of sales processes. If you’re not crushing your goals, consider how Sales Engagement can uplift your KPIs. First, take a look at the following Sales KPIs that measure how organizations reach their business objectives. Average win rate – What is the ratio of closed won deals to the total number of won and lost deals? Average sales cycle length – How long does it take, on average, to close deals? The shorter the sales cycle to a successful deal, the better. Average deal size – On average, what is the worth of deals sellers are managing at any given point in the sales process? Time spent selling – This KPI compares the time sales team members spend selling, as opposed to time spent engaged in other operational tasks, such as training sessions, internal meetings, and administrative tasks. Lead response time – How long does it take for leads to positively respond to sales team members’ pitches or calls to action? Content usage – This KPI measures how much a piece of content is accessed and used by sales team members during the sales process, furthering successful sales deal completion. This knowledge allows managers to minimize the wasting of time, money and human resources spent on developing the content – and on the sales process itself. New Leads – How are your sales agents contributing to the generation of new leads and the expansion of the company as a whole? Client acquisition rates – How many new leads convert to paying customers? This KPI should be compared to the number of new leads generated, as well as to the number of prospective leads any given agent initially reaches out to. Engagement – How many interactions do your sales agents have with customers and how can these communications be qualified? Competitor pricing – Keeping track of your competitor’s pricing rates can give you an added competitive edge. How does your price compare to that of competitors? Increased upsell and cross-sell rates – This KPI enables sales agents to identify whether certain verticals or segments might respond better to certain upsell or cross-sell pitches. Understanding the voice of the customer – Is your sales team aligned with the customer’s experiences with and expectations for your products or services, positioning themselves to respond to any relevant needs? For this KPI to be effective, sales teams must gather and use information from multiple touchpoints in a timely fashion. Sales volume – Where is your product in highest demand (in which location) and where does it need added promotional efforts? Net promoter score – On a scale from 0-10, how likely are customers to recommend your product to others? This KPI helps you assess the customer’s overall satisfaction with and loyalty to the company, enabling more effective targeting and nurturing efforts. New hire time to productivity – How long does it take to train new hires and for them to reach full productivity? Sales Engagement is the ability to measure the interactions between a sales organization and the buyer. Reading the pulse of the buyer, at every touchpoint in the sales journey, gives sales teams the advantage of gauging buyers’ interest and using that data to present impactful content quickly and communicate with prospective customers effectively. To fully enable the value of Sales Engagement, it’s imperative to use a Sales Engagement Platform (SEP) that is unified with your CRM, and that serves buyers and sales reps at every point in the funnel. This holistic approach, that Aragon Research coins a “new breed of Sales Engagement,” is best performed by SEPs that includes all of the tools needed to sell in an always-connected online world. Simply logging calls, sending emails, and tracking responses are no longer enough. An end-to-end SEP is needed to uplift sales KPIs and significantly increase sales. There are very few companies that can currently give you that end-to-end process. In that sense, DealHub is in a class of its own. DealHub is this new breed of unified Sales Engagement Platform; the only SEP that serves buyers and sales teams at each point in the sales process, from qualification to on-boarding with the sales materials needed to close a deal quickly and easily. A shorter sales cycle enables sales teams to expand their reach, engage with more customers and complete more deals within the same time period. It also is more likely to result in a positive consumer experience, as customers spend less time on sales calls and more time engaged in other business obligations. 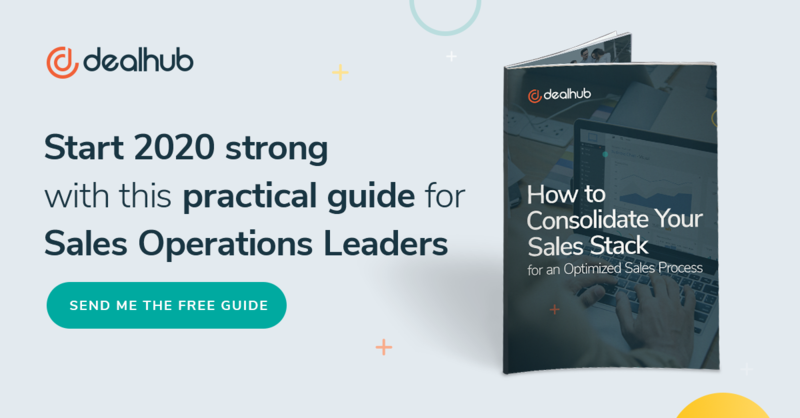 Engagement, the main KPI that can be tracked by DealHub, is broken down into who opened a given file, who read it, what component was engaged with, etc., supporting your company’s sales process goals. We enable the enacting of a single guided selling system. We optimize the sales process, so your sales team spends less time on administrative work and creating proposals and more time actively reaching and selling to more clients. In a single sales cycle, DealHub clients can access and contact more stakeholders and decision makers within the target organization, lowering response time exponentially. Use of content along the buyer’s journey is a proven strategy for marketing and sales success. Educate and delight buyers with content that adds value and helps them make purchasing decisions. Learn how to leverage content to enrich your buyer’s journey here. DealHub’s unified SEP helps sales teams gauge which content works best in helping buyers move further along the sales funnel by delivering the right content, at the right time. Rich branded content such as personalized data sheets, videos, quotes, and contracts are delivered to prospects based on their needs. Reports indicate that the probability of converting a new prospect is relatively small, just 5-20%. At the same time, the likelihood of converting an existing customer is 60-70% and returning customers spend 33% more than new ones. Therefore, in-depth knowledge of customer demands and meeting these demands promptly is crucial, as they provide the customer with lifetime value. This value forges a bond between customer and sales team, opening the door to upsell and cross-sell opportunities. DealHub’s guided selling system enables sales teams to enrich their proposals and present their customers with more packaging, sales and premium offers. Our combination of analytic capabilities and the use of our playbook will enlighten the salesperson as to what exactly interests a given stakeholder – and how to go about selling him on it. DealHub monitors upsell numbers to only present certain offers to those customers likely to benefit from them and convert. The best way to increase revenues is not to add deals to your sales team’s workload. Instead, efforts should be directed towards increasing your sales team’s win rate. A buyer-centric approach should be taken, during which the sales rep focuses on personalizing deals, so they are most relevant to the customer. DealHub’s guided selling system provides sales agents with real-time alerts and analytics on sales deals in progress, enabling agents to foster a more responsive, personal and relevant approach to each deal. Keeping track of your competitor’s pricing rates can give you an added competitive edge. DealHub enables the presentation of a competitor’s price, to help sales agents engage with customers and make sales. Training new sales reps are crucial to the success of their future endeavors. Without proper training, reps cannot be expected to effectively lead customers through the sales funnel and convert. When it comes to closing deals, time is of the essence. Using DealHub has been helping to shorten the on-boarding period for new reps, while still equipping them with the knowledge and skills they need. Integrating data collecting and analysis processes, DealHub positions sales agents for success by leading them to any organization’s decision-makers and equipping them with the knowledge they need to sell the stakeholder on a given product or solution. Because the entire process is guided and personalized, the on-boarding period for new reps is shortened, enabling them to get the work done faster, without compromising on work quality. The rules of sales engagement are simple: get to know your buyers and give them what they want. Give your buyers what they want and you’ll be on your way to crushing your sales goals. DealHub’s award-winning SEP integrates seamlessly with Salesforce CRM and Microsoft Dynamics CRM. To create an easy-to-use Sales Engagement Platform that uplifts your Sales KPIs, turn to DealHub.io. Contact us today for a free demo and put the power of sales engagement to work in your organization. As VP of Growth, Gideon is extremely passionate about helping companies gain a more informed and actionable understanding of the changing landscape within Sales Engagement. He is a regular content contributor in this area of expertise and draws inspiration from being afoot to the latest trends and statistics influencing Sales Engagement.